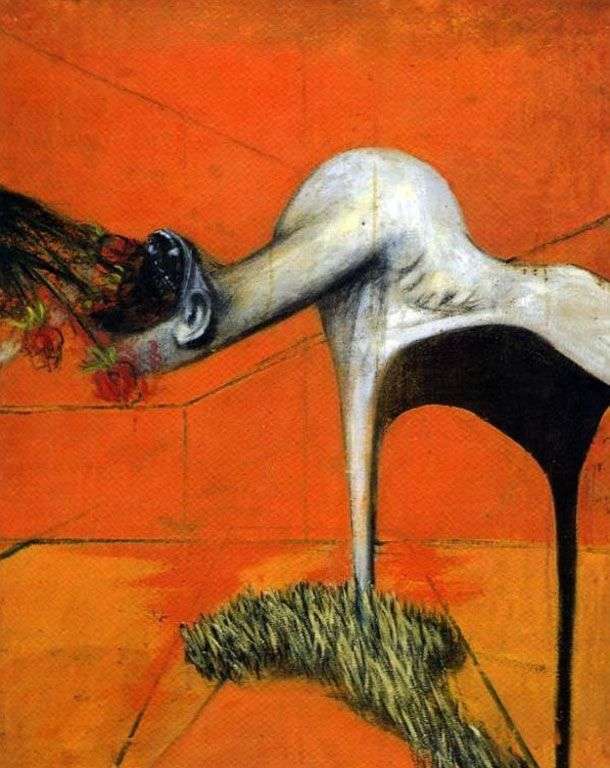 In a painting without the name of the English artist-expressionist Francis Bacon, a phantasmagoric creature, a piano-like ostrich pianist, is taking, or rather, devouring flowers and applause as a token of gratitude for the “virtuoso” performance. The psychological impact of the picture on the viewer is very strong, tense and anxious. The orange background of the picture, is perceived as an approaching fire, all-consuming and deadly dangerous. The ridiculous figure of the bipedal creature, whose name you can not imagine, is undoubtedly connected with the approaching danger. It, this being is just the beginning of the end. The beginning of a rigid dictatorship of such beings who are already coming to us, go to our land. This picture of the artist is among his early works. In the works of Bacon of this period, the influence of the painting of the late Picasso and Dali is felt. Description and meaning of the painting Untitled by Francis Bacon.